Technology plays a major role in marketing on the Internet. Finding the pieces that you need to solve the technology puzzle can be very challenging indeed. That’s why we’ve put together a suite of tools that work together seamlessly to get you the results you are looking for. We want to make your life simpler, not more complicated. We’ve taken the mystery and effort out of managing your dynamic content on the Web. We provide you with a CMS (content management system) to be robust, with a rich feature set that performs all of the functions that you’d expect and then some. Best of all, it’s simple to use. What’s a Web CMS? A CMS is the software that runs your website. Its job is to pull together and manage all of the various elements that make your website what it is on the Internet. This includes plain text, pictures, videos, documents (.pdf,.doc, etc. ), just about anything you can think of really. As easy as 1-2-3 One of the major benefits of our CMS is that it’s simple to use, requiring almost no technical skill. This will make your life a whole lot easier when it comes to managing your new website. The simple user interface (UI) allows for ease of site updates including adding content or pages, changing page layouts, and adding new features. Training too… We’ll teach you everything you need to know. Making sure you know how to use your new website is of utmost importance. Moreover, you are never alone. Your dedicated Internet Marketing Consultant or Help Desk Support is just a phone call away to give you a hand or answer your questions. Sorry, no cookie-cutter websites here You don’t have to select a design from a bunch of website templates with Cazbah. Every one of our websites is custom designed from the ground-up to address the specific needs and unique value of each and every one of our customers. Our job is to make you successful, and your new website will play a leading role in accomplishing that goal. We have to make you stand-out from the crowd. That won’t happen if you look just like everybody else. We’re extensible Your success is based on your growth. Making sure that you continue to add new content and pages to your website is the best way to ensure that you continue to grow. You may start out small but, we expect and encourage you to grow the size of your website over time. Your new Cazbah website can be as large as you need it to be. As you continue to grow there is no need to worry about upgrades or switching to a new CMS. The Cazbah platform can grow to meet your company’s needs so you never have to worry about outgrowing our technology. Ecommerce – Sell it online When it comes to selling products online, Cazbah is at the head-of-the-class. We’ve been building Ecommerce websites that generate tens-of-millions of dollars in new revenue for our customers for more than a decade. We know what it takes and we build your Ecommerce catalog from scratch, providing you with all of the pieces to make your Ecommerce experience a success. Cazbah’s Ecommerce engine and shopping cart allow you to keep your transactions are safe and protected with secure socket layer (SSL) 128 bit encryption. We’ll help you set up your merchant account and connect you to the credit card payment processor that best fits your needs. Shipping calculations are no issue with Cazbah. Each and every order that is processed on your website will be shipped according to the pre-determined shipping options that you make available to your customers. Having products to sell is one thing. Having a place to sell them is another. That’s why we developed extensive e-commerce functionality into the Cazbah technology, making it easy for your customers to purchase your products. Cazbah Intermediate, Advanced, and Ultimate come with a comprehensive e-commerce platform and shopping cart, along with all of the tools to manage your online store. Our product manager is easy to use and update. 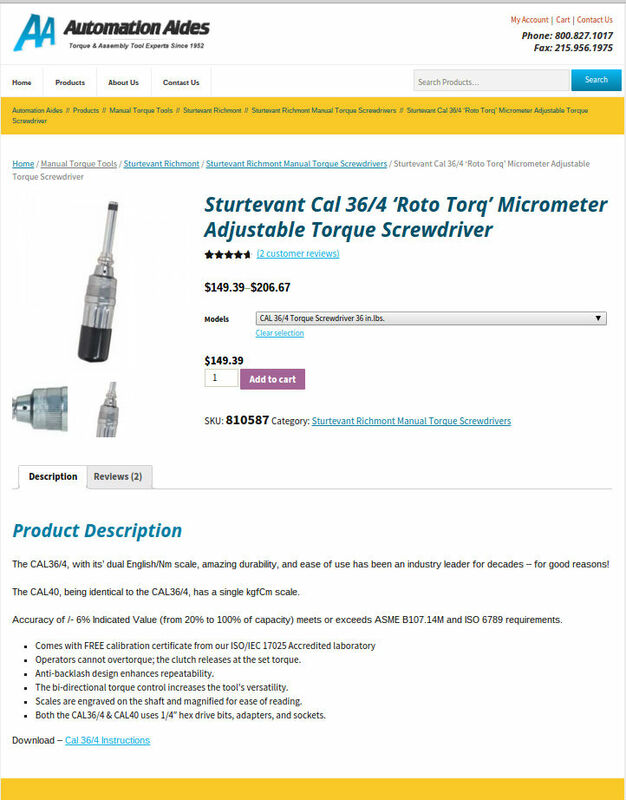 Products can be added or removed, prices updated and information accessed quickly and easily. We build your e-commerce catalog and shopping cart as part of the Cazbah Total Internet Marketing Solution. It’s included with Cazbah Advanced, Intermediate, and Ultimate! Once built, your Internet Marketing Consultant will work with you on how to manage your new online store in order to maximize your eCommerce results. Knowing what’s transacting on your online store is very important. That’s why your Internet Marketing Consultant will continuously monitor all of the shopping activity associated with your new website. They are well equipped to evaluate your online store’s performance through the use of a set of analytical reports that track and measure everything associated with your new website. It’s easy to waste a lot of time and money on SEO efforts that generate little or no revenue. Without a doubt, SEO needs to be a major part of your Internet Marketing mix. That’s why all Cazbah Internet Marketing Consultants are experts who are highly skilled in the use of a multitude of optimization tools. We don’t just focus on traffic and site visits, but more importantly on conversion and sales. What is SEO? 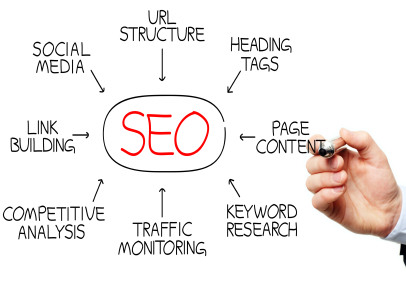 SEO is the process of improving a website’s organic ranking in search results. It involves strategic tactics including keyword analysis, content creation, HTML manipulation, and linking to enhance the authority and relevance of a particular website. Why is SEO important? If you are reading this then you’ve heard of search engines and you understand how important they are to your success on the Internet. The vast majority, nearly 80%, of all Internet users begin their daily quest for knowledge at a search engine. Making sure that you are found, preferably at the top of the first page of the search results, is why search engine optimization (SEO) is so critical to small business success. How does SEO at Cazbah work? As with any process, SEO is a well-defined, interdependent and sequential set of steps that are required in order to achieve the desired results (again, top of the first page). Despite what you may have heard, there are no shortcuts to good SEO. Come to think of it, that’s not entirely true. There are some shortcuts you can take. But, just like driving your car 100 mph down the highway, because you are late for an appointment, you are likely to get caught. If search engines detect you are using black hat techniques, your website will lose its ranking. Then its game over! We don’t take uncalculated risks with your business on the Web. That’s why your Internet Marketing Consultant won’t be recommending any SEO shortcuts. The risks are far too high and frankly, we just don’t do business that way. Cazbah SEO Process: Your Internet Marketing Consultant works directly with you to understand your business, your products and your services. They want to know about who your customers are, where they are and why they buy from you. They take this information and put together a set of assumptions that they then validate and / or refute, based on extensive additional research on the Internet. Using a number of different SEO tools, your Internet Marketing Consultant will determine the appropriate keywords that you should be using to optimize your new website in order to attract the ‘right’ visitors, the ones who buy. Your IMC will then show you how to build compelling and useful Content, give that content Visibility on the internet, then Measure the performance of that content. Learn More about the Cazbah SEO process. Pay Per Click also known as PPC, most often associated with Google Ad Words, is an effective form of search engine advertising. For a fee, on a per-click basis, the Google will place your listing (advertisement) in a special highlighted section called sponsored links or sponsored ads. Your dedicated Internet Marketing Consultant will apply all of the process steps necessary to help you select the correct key terms for your search advertising campaigns. Cazbah is a Google AdWords certified Partner so you can be assured that we get the most our of your advertising dollars . Pay Per Click is a service that you pay for when your ad is clicked. We have found, over the years, that we can generate immediate search results and conversion for our small business customers through the effective use of PPC. Small businesses don’t have big budgets, so we suggest that you start small and consult your Internet Marketing Consultant. It won’t cost you anything to set up your Ad Words account and to get your sponsored link (ad) on the SERP page. It only costs you when someone clicks on your link, and that is based on the bid price that you paid for it. Your dedicated Internet Marketing Consultant will assist you in selecting the appropriate key words and phrases for your PPC campaigns. How does Pay Per Click work? Search engines also allow you to set a budget on a daily, weekly or monthly basis, so you can manage your advertising expenses closely. With PPC advertising you can adjust your budget to your sales conversion rate, helping you determine how aggressively you want to invest in this part of your marketing mix. This will also keep you from going over budget or spending money on non-converting terms. One of the benefits of PPC that we have realized for our small business customers is the immediate response we can see from a well managed Ad Words campaign. Because of how PPC advertising works, you can get to the top of the SERP page with a minimal investment. This in turn means that you are likely to get immediate sales results as well. Making sure you get the right traffic from your PPC campaigns is very important. Your dedicated Internet Marketing Consultant will ensure that all of your PPC campaigns are as efficient and effective as possible. Using Analytics, they will track the various keywords and phrases that are being searched. They will determine which of your ads has the best response and which don’t, and whether or not you are getting any conversion (sales) from them. Armed with this information, your Internet Marketing Consultant can recommend the types of changes that will have an immediate positive effect on your PPC campaigns. Local Optmiization is a vital element of your Internet Marketing mix, if you depend on local customers for your sales. It takes time and knowledge but, it will make your company stand out above your competition, ultimately driving more traffic to your website and through your front door. Relevance – Has to do with the physical address, category, keywords, area code, zip code and anything else that would place your small business website in a reasonably close proximity to the person doing the search. Search engines know where you are when you do your search. Authority – Involves the quality of the small business Websites that are provided in the search results. Things like domain authority and page authority – the weighting or score related to the number of established links to your site, the relevance and significance of the content on the site, and a host of other factors determine where your small business website will come up in the local search results. 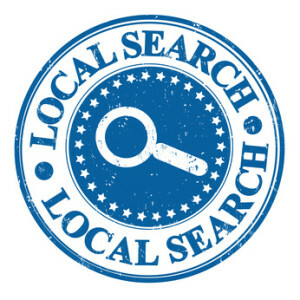 Local Optimization is a vital marketing tactic for any small business that depends on local customers for their sales. It takes time and knowledge but, it will make your small business stand out above your competition, ultimately driving more traffic to your website and through your front door. Building relationships with your prospects and customers is what marketing is all about. Email marketing is still the most effective way to communicate with them to grow your small business. Cazbah’s email marketing tools ensure that your messages are professional grade and that they get delivered to the right people. The days of sending out brochures and tri-fold mailers are over. Well, that’s not entirely true. You just threw a couple away this morning… Smart Internet Marketers know that there is a much better way to deliver their brand message and unique value to their target customers. A method that will consistently produce double-digit response rates! That better way is eMail marketing; sending targeted emails to a specific list of recipients. Email Marketing is the most effective way for you to establish and maintain regular and frequent contact with your existing and prospective customers. It is an ideal marketing medium for you to enhance existing customer relationships through loyalty programs or promotions. It’s a great way to increase awareness and promote your brand as well as generating new customers. As with everything else that you do on the Web, there is a right-way to do it, and a wrong-way. Your Internet Marketing Consultant will ensure that you always do it the right way. We developed our first Email Marketing interface in 2001 and since then we have continuously improved our processes for ensuring our customers’ successful email marketing campaigns. Your Cazbah Internet Marketing Consultant will work directly with you to ensure that you are taking full advantage of Email Marketing as a principle part of your Internet marketing mix. They will provide you with expert advice on the right way to build an email list. Working with the Cazbah production team, they will design the emails and develop the email campaigns that will be sent to your targeted list of recipients. 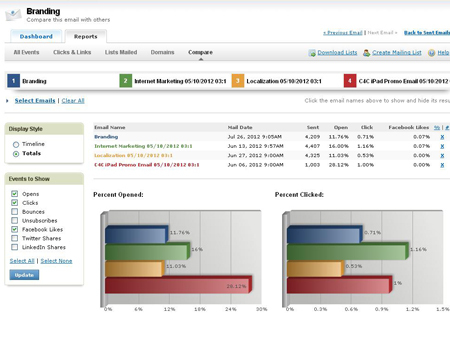 Utilizing the analytical tools within Cazbah’s Email Marketing interface, your Internet Marketing Consultant will track each email campaign down to the individual recipient. They will determine how many people received it, read it, how many read it more than once and who forwarded it to someone else. Your Internet Marketing Consultant can also see who clicked on the links in your emails and who visited your new website. 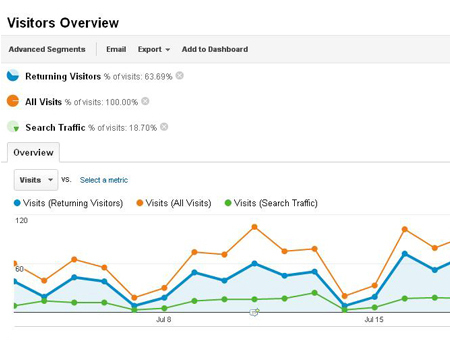 Using the analytics function of your website they can also see where website visitors went and what web pages they looked at. Knowing that you are being effective with your Email marketing is all important. In a word, your Internet Marketing Consultant will tell you everything about your Email Marketing campaigns. CAN-SPAM Act This is serious business. As we mentioned, there is a right way and a wrong way. If you do it the wrong way, you could get flagged as a Spammer, get severely fined or, end up on the wrong side of a lawsuit. Not good! Your Cazbah Internet Marketing Consultant will ensure that all of the email campaigns that we design and send on your behalf are in compliance with the CAN-SPAM Act. It is estimated that 1 in 4 Internet users log into social networking sites every day. Furthermore, surveys show that 1 in 8 Internet users will visit social networking sites to conduct business. That’s why it’s important to consider Social Media as part of your overall marketing mix. While there are thousands of Social Media tools available online today, your Cazbah Internet Marketing Consultant has an expert understanding of which tools should be applied to your products and services and how to best utilize them. Social Media builds community and promotes communication between your prospects, customers, community members and yourself. Of particular importance is the immediate feedback loop, or voice-of-customer (VOC) data, that can be gained through an effective use of Social Media. Of the thousands of different Social Media tools currently available, there are three basic types that should be a principle focus of any small business. Collaborative projects, such as the development of a company blog and the establishment of a micro-blogging presence, utilizing a tool like Twitter, are two of the first steps that any small business should take towards Social Media. The ability to easily share content online with your community of interested recipients is another benefit of Social Media. Many small businesses have product and service videos that they distribute to their prospects and customers. Using YouTube, the second largest search engine in the world, small businesses can put the right content in the form of videos, into the hands of their customers and community members. Social networking sites are online platforms that focus on building relationships among people who share interests, activities, backgrounds or real-life connections. Without a doubt, Facebook is the most widely used social networking platform in existence today. Another social networking platform that deserves attention is LinkedIn. Your LinkedIn profile page and your small business company page are used primarily for occupational networking, although they can also be useful for recruiting and business development. Your website has a voice. What is it trying to tell you? It’s great to get specific key terms ranked on search engines but, how do you know if those terms are paying off? Are you advertising with Google or on a partner’s website? How do you know if it is worth the money you are paying? Are you sending out Email campaigns on a regular basis? Which campaigns work better than others and why? These are just a few of the questions that will be answered by your Cazbah Internet Marketing Consultant. They are trained and qualified to integrate and use analytics to figure out who is using your website, how they got there and what they are looking at, among other statistics. Instead of guessing what you should do, Cazbah will give you the information and advice on exactly what to do in order to make your online business successful. One of the major benefits of Internet for small businesses is the ability to ‘see’ everything that is going on with their Internet Marketing activities, in real time. Analytics, which is the very thorough analysis and reporting of ‘ALL’ your activities on the Web, has revolutionized the way we market on the Internet. We now have a complete and instantaneous understanding of every conceivable metric associated with the traffic and other activities associated with your Internet Marketing. This gives us a tremendous ability to respond immediately to this data because we can evaluate it in-real-time, as it’s happening. Your Account Manager has the ability to report to you on ‘ALL’ of the numerous metrics associated with your new website. Your Cazbah dedicated Internet Marketing Consultant is an expert in the interpretation of these metrics and will help you understand the effectiveness of your Internet Marketing efforts, at a very detailed level. They won’t leave anything to chance and they understand that there is very little margin of error when it comes to the success of your small business on the Internet.